Every so often, the desire to fill my stomach with delicious Kentucky Fried Chicken becomes an urge I can no longer ignore. Like Spock and the Pon farr, Lori knows that it will only get worse until that itch gets scratched. Leaving for Japan has me worried about a lot of things, not the least of which will be where will I go to get fried chicken that isn’t covered in fish flakes and slathered in squid sauce. So I was delighted to hear that not only is there a KFC in Osaka, but it’s actually an All You Can Eat Buffet. Apparently for 1,800¥ you can eat until your arteries are nothing but a racetrack for the 11 herbs and spices. Beer, Bread, Chicken, Pasta, Beer, this is just another shining example of Japan being light years ahead of the rest of the world. Although, one can imagine the folly of KFC trying this out in the States. There’s something about a restaurant that already sells food in buckets that probably isn’t conducive to the kind of ‘responsible eating’ that the ‘States is known for. The Hanshin Tigers are the perpetual underdog in Japanese baseball. Much like the Boston Red Sox, the fans of this team (and geographically, I will be one) know that the losing streak must be due to a curse. The Sox have the Bambino, and the Tigers have… Colonel Harland David Sanders. ..Did not have any lookalikes in the revelry, so the enthusiastic Tigers fans found the closest thing to a Hakujin.. The picked him up, put him in a Tiger’s uniform, and threw him in the river. After they failed to win the championship for many years, the fans decided that the reason for the losing streak was their deep-sixing the Colonel, and they wouldn’t win again until he was fished out of the canal. 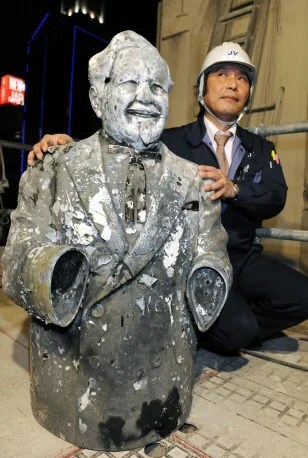 They had an 18 year losing streak, that finally broke in 2003, when they got in to the Championship series again – in response, the KFC outlets in Kobe and Osaka moved their Colonel Sanders statues inside until the series was over to protect them from Tigers fans. They finally pulled the Colonel out in 2009 while constructing a new boardwalk, but they have never recovered the left hand. 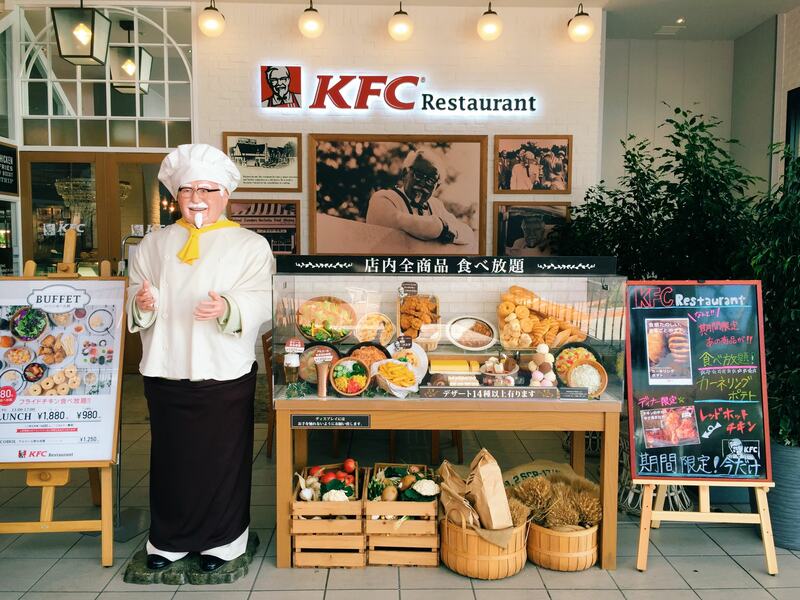 It is in the KFC headquarters in Yokohama, but not viewable by the public. All he wants is for you to be happy and eat his chicken that he can’t make now because he has no hands. So that’s the Curse of the Colonel – Hopefully while we’re there we can end that curse and get a win for my new team. Or at the very least, have some more blog posts about the fascinating, regimented fun and cheering at a game there.